The AAUW membership year is July to June, and it’s time to for branch members to pay dues for the 2011-12 AAUW year. This year, if you pay by credit card, we urge you to use the Membership Payment Plan (MPP) on the national AAUW website instead of our PayPal account. The reason is that for every payment made through PayPal, our branch pays a fee – we lose some of the money! 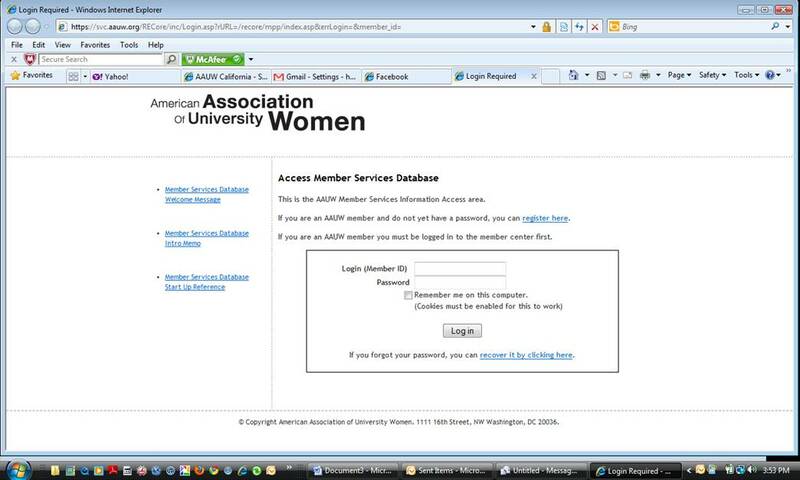 We joined the national AAUW MPP when it was first available and found that it works very well. Any branch dues money paid through the MPP is transferred in a timely manner directly into our checking account. If the Tar Heel Branch is your first (or only) branch, you can pay your national, AAUW NC, and branch dues (total $65) through the MPP. If you are a member of another branch where you pay AAUW and/or AAUW NC dues, or if you are a life member of AAUW, the amount on your “bill” in the MPP will be adjusted accordingly. To pay your dues through the MPP, click on this link or type the URL into your browser. Below is the screen you will see next. You will need your AAUW ID#. If you don’t remember it and don’t have the latest copy of Outlook where it is printed on the mailing label or a recent roster sent to the e-mail list, or you will see a link for recovering it. You will also need a password. If you don’t have one, you will see a link where you can register for one. NOTE: If you haven’t already registered for a password, this seems like a bit of work. But once you have access to the Member Services Database, you will be glad. You can update your record, find contact information for the branch members and branch and state officers, make contributions linked to the branch and more. Look down the list on the left side of the screen and click on Personal Membership MPP. That is where you can pay your dues. More about using the MPP. Of course, if you choose to pay by check you can make it payable to “AAUW Tar Heel Branch” mail it to our contact address. $16.00 — if you have paid AAUW national dues, but have not yet paid AAUW NC dues. *$46 of the $65 and $16 of the $17 is tax deductible as a charitable contribution to AAUW. Dues to the branch and AAUW NC are not deductible as charitable contributions, but may be deductible as professional expenses. Thanks to AAUW CA Online for their version of the above message which we have edited for the Tar Heel (NC) branch.